Bill Lucy recently moved to Fredericksburg, Texas where he built a new home and hangar with a 40 ft. x 14 ft. Schweiss bifold liftstrap door. He flies a PT-17 Stearman for fun and when on the job he pilots a Citation Sovereign for NetJets. 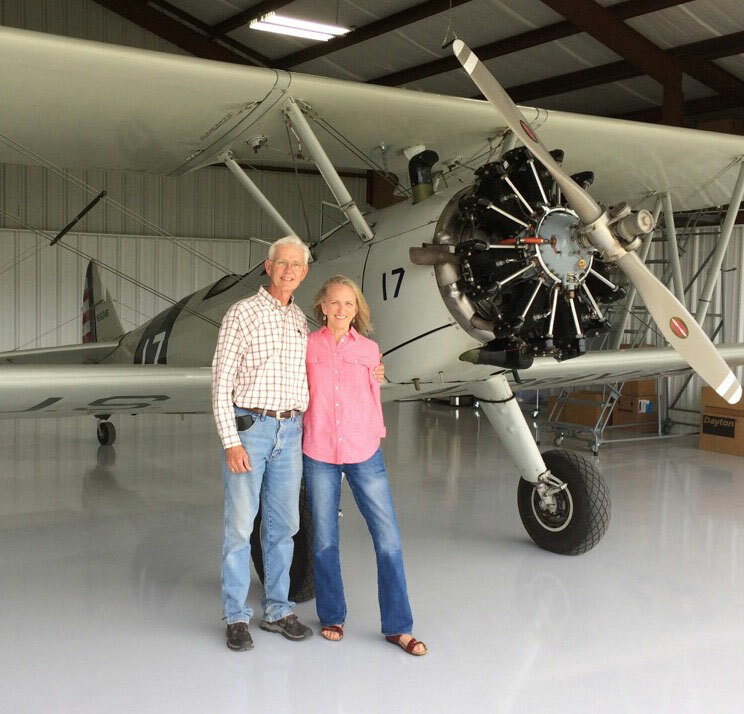 That may have been the exact thoughts of Bill Lucy, who recently chose to move to Fredericksburg from Horseshoe Bay, Texas where he built his new home after he built a hangar and adjacent 1,600 ft. grass runway. Lucy said he made his decision to purchase a Schweiss Bifold liftstrap door after reading a “Must See Photo” story on the Schweiss Doors website about old-timer pilot, Gene Fuchs of Morgan, Minnesota who owns three Schweiss doors. “When I started looking at doors, your ‘Must See Photo’ Schweiss website profile on Mr. Fuchs sold me; I printed the article, put it in my hangar file, and called Schweiss. I did research metal buildings and in the process saw the Schweiss Doors advertisement. That led to noticing doors in other hangars, along with the testimonies of others on your website. The experience has been great since day one. Jeremy and others at Schweiss Doors were available and helpful. Schweiss was always available to answer questions and provide the needed details, even on weekends.” said Lucy. The bifold door on his hangar measures in at 40 ft. x 14 ft. clear, more than adequate to hangar his plane. The bifold door on it opens and closes quick and quietly with the four strong liftstraps and locks weather tight with the patented auto latch strap system that Schweiss bifold doors are known for. Time has been a big factor in Lucy getting his boots on the ground in Fredericksburg. 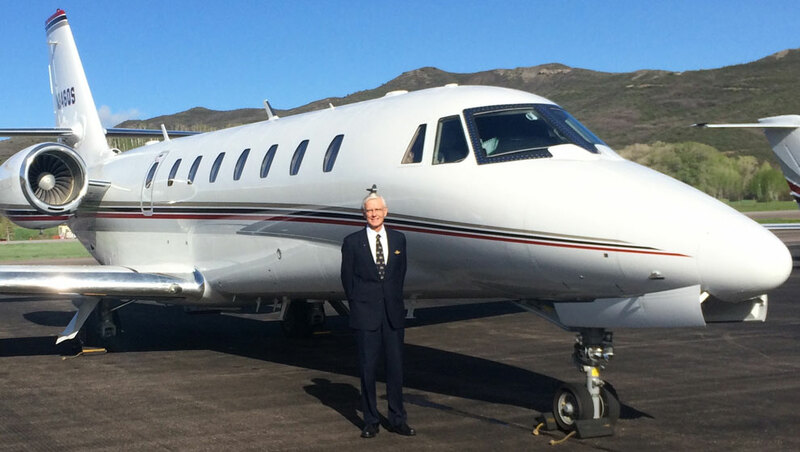 His love of flying which began 43 years ago at Horseshoe Bay has led him to a career flying a mid-size cabin eight-passenger Citation Sovereign for NetJets. “A college friend gave me his collection of past flying magazines and I read every one, cover to cover. The airline trips to and from school gave me the opportunity to fly and it grew into a passion for someday wanting to be a pilot. Many of my dates with soon-to-be wife, Cheron, included watching planes land at HOU. After college, we had the privilege to start flying lessons together and Cheron and I both received our private licenses in 1971. All of our flying was for business and pleasure until I started with NetJets in 2001,” said Lucy. “I’ve been flying for NetJets for 15 years and it's been an amazing opportunity. NetJets is a great company. To have the privilege of their support as a pilot; operations, dispatch, weather, owner services, and a safety culture second to none, makes flying into all of the airports, big and small, a real joy. The Sovereign has tremendous short field capability and I have landed in some out of way places. The folks we fly enjoy their privacy; we do sponsor many of the top touring pros and I've had the privilege to fly them. “Wherever I've landed, I enjoy peeking into the hangars. I've looked in a thousand of them, old and new, small and gigantic. And many have the Schweiss door system,” said Lucy. 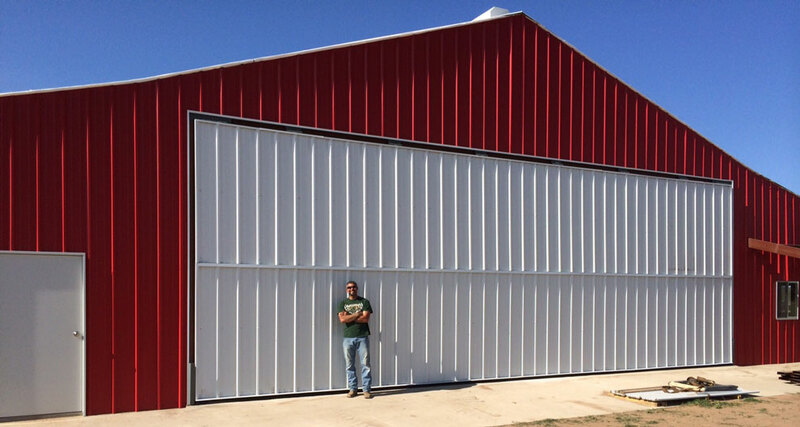 His new steel 85 ft. x 40 ft. red and white hangar stands out like the colorful wildflowers that emblazon the hills around Fredericksburg. His plan all along was to build it for a Stearman, but he did research the dimensions of Huskey's and Cessna 180s. Their adjacent ranch home was designed and built by his architect son, Travis, with Bercy Chen architects, Austin, Texas. It is contemporary and compliments the ranch setting. “The design for the hangar started with our desire for it to include a bunkhouse for grandkids, office and workshop. My wife, Cheron, picked the color . . . the red barn look for our ranch,” explained Lucy. 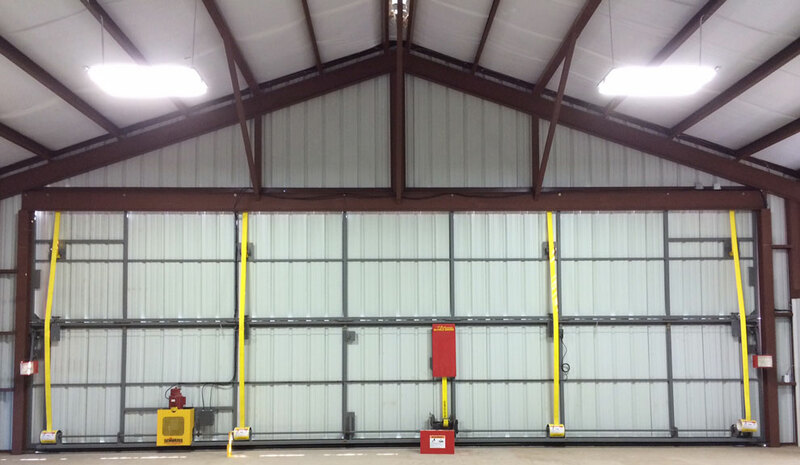 The hangar is a weld-up, design with materials by Metal Mart in Burnet, Texas, and constructed by Rios Construction of Marble Falls, Texas. Lucy flies a Stearman. The Boeing/Stearman Model 75 primary trainer is probably the best-known biplane in aviation history. The biplane introduced more of World War II's “Greatest Generation” to flight than any other airplane. Commonly referred to as the Stearman PT-17, it was manufactured by the Stearman Aircraft Co. in Wichita, KS, from 1934 through 1945. 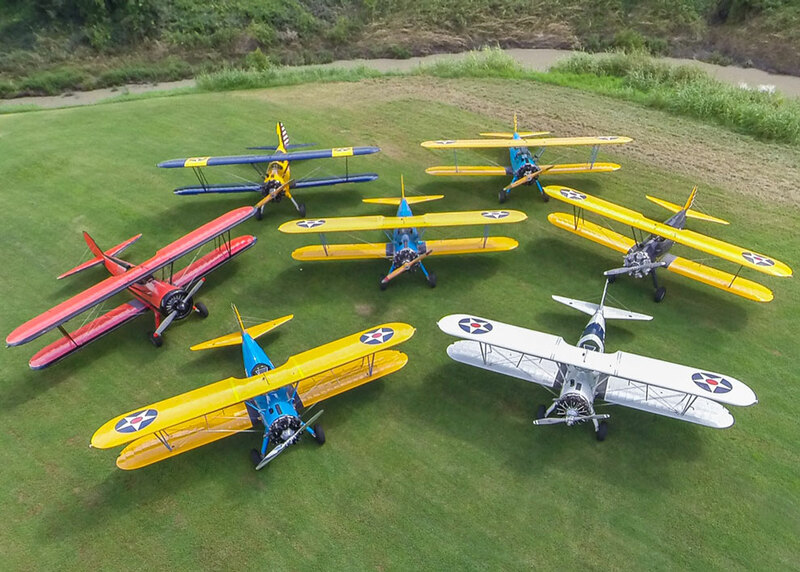 Knowledgeable enthusiasts estimate about 1,000 Stearman's around the world are still flying. The actual total of Model 75s that were completed from the prototype X-75 to the final E75 built in 1945 was 8,428. “Crazy; I owned it from 1995-2001, sold it, started looking this year and a friend found this same plane for sale in California, so I bought it again; it was restored by Pete Jones Air Repair in 1990. It has a Jacobs 275 h.p. STC engine,” said Lucy. After World War II, Stearmans were sold as surplus. A single plane could be bought for $500. Many were converted for use as crop dusters and were working airplanes. 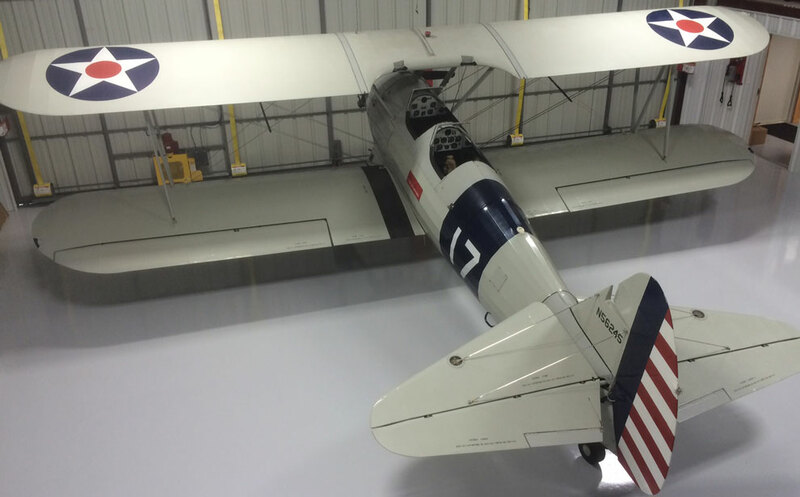 The price of a Stearman today ranges from $70,000 up, depending on condition and quality of restoration. “My 1,600 ft. grass runway breaks at about 800 ft. and slopes downhill. It is fenced to keep the Red Angus cows we raise off the runway when we are flying. When my landings go past 800 ft. they are really going downhill fast. I can leap tall buildings in a single landing,” said Lucy referring to it being called “The Pilot Maker” with the big Stearman tires, stiff legs and tailwheel. “Since having the Schweiss door, I've noticed other hangar doors in my flying for NetJets. There are all kinds of old, massive, weird engineered doors out there - cable/counter weights, 100x50 ft., 25 ft. hydraulic arms and come-alongs. You could travel the country and publish a coffee table book on old hangars, especially the large wooden ones. And include the ultra new ones; many are privately-owned and filled with great toys and many behind Schweiss doors,” added Lucy. His choice of a bifold door was partially based on price and he thought the strap model looked great. The auto latch, he said, makes for a tight seal when closing. Four bifold liftstraps and a Schweiss autolatch system open and lock the door weather tight. Bill and his wife, Cheron, are both licensed pilots and fly this restored Stearman biplane. Lucy previously owned this Stearman, sold it in 2001 and when looking for another last year he came across the same plane for sale and bought it again. The door is on! It was installed with no problem following the step-by-step instruction manual. Miguel and Orlando Rios of Rios Construction built the hangar. The Schweiss 40 ft. x 14 ft. bifold doorframe is mounted on the hangar and ready for liftstraps and white cladding. Lucy said after he had installed the door he had a Schweiss certified installer look at it before he opened it. Following the instruction manual it was ready to be opened. This pack of Stearman's show some of the various color formations from Lucy's silver and blue to numerous others. Many of the estimated 1,000 or so survivors have been restored to their original colors - blue fuselage and yellow wings for the "Kaydet," Army Air Corps version and mostly all-yellow for Navy "Yellow Peril" planes. Lucy can taxi his Stearman out of the hangar onto a 1,600 ft. grass runway adjacent to his new home. Lucy first began flying about 43 years ago. Since that time he has graduated to flying an eight-passenger Citation Sovereign for NetJets.